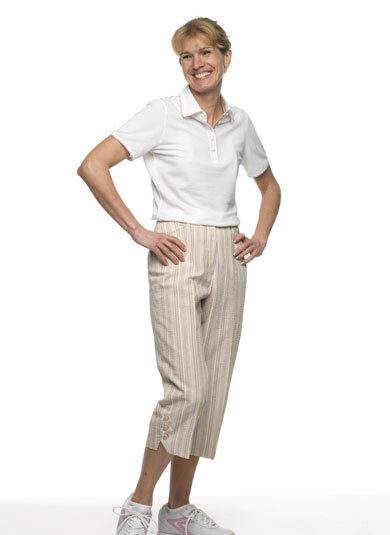 By Valerie Herman, flat fronted, relaxed fit, cut off trousers with approx 4cm belt loops. Slanted front pockets which are double lined to prevent holes, side elasticated waistband (approx 4cm) and smart 3 button detail on the hem. Cotton/polyester seersucker fabric, these trousers look fresh and stay cool. Click here for a close up of the trousers. Wear with the half sleeved polo shirt with the matching trim. We also have the matching visor available. Inside leg length 20.5". Machine Wash.